The Mount Baldo massif reaches a maximum height of 2,218 mt. MALS. It is situated between the provinces of Trento and Verona, lying between the municipalities of San Zeno di Montagna, Ala, Avio, Caprino Veronese, Ferrara di Monte Baldo, Brentonico, Nago–Torbole, Brenzone and Malcesine. Its main mountain range has a north-south orientation, its natural borders are in the south the near Capino Veronese beginning plain, Lake Garda for 40 kilometres along the west side, in the north a valley joining Rovereto to Nago-Torbole, and Vallagrina on the east side. 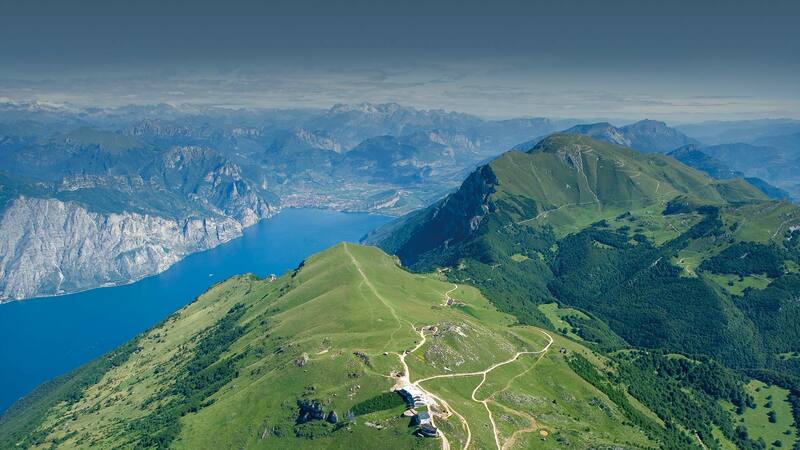 The largest mountain chain consists in two parts, Mount Baldo and Mount Altissimo, which stands alone. Starting in the south, its peaks are Creste di Naole (1660 m), the mountain ridge of Costabella (2062 m), Coal Santo (2072 m), Vetta delle Buse (2154 m), Sascaga (2134 m), Punta Telegrafo (2200 m), Punta Pettorina (2191 m), Valdritta (2218 m), Longino (2180 m), Pozzette (2128 m), Dos della Colma (1830 m) and l’Altissimo (2078 m). Seen from the south, on a clear winter’s day, Mount Baldo stands in all its impressive beauty: a candid white peak and slopes already warmed by the first breezes of spring. This image sums up the extraordinary characteristic of this place: a mountain that comes alive in every season. In winter, the “Garden of Europe,” much admired for its prodigious blooms during the other seasons, becomes a paradise for snow-lovers and skiing enthusiasts. On Mount Baldo, every season has its own irresistible charm, and it represents an everlasting invitation to experience this mountain in all its different and surprising variations. 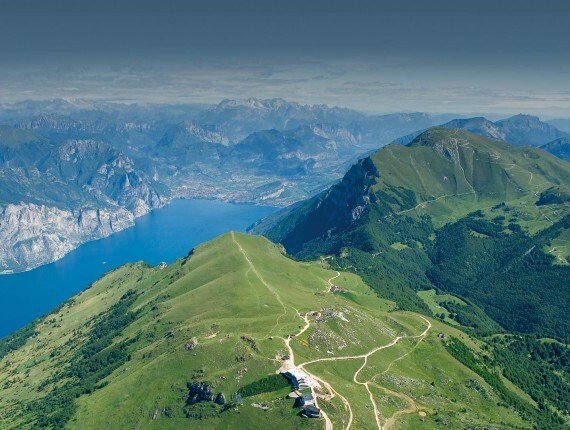 Mount Baldo is situated between the River Adige and Lake Garda, in a strategic position that makes him preserve both geological and prehistoric findings of great interest. It is also a witness to important events that have marked history and a natural oasis that is perfectly intact. Mount Baldo is a truly unique mountain. The lake climate influence on the mountain allows many different natural environments to co-exist, from the Mediterranean scrub to the pastures and rocks on the higher peaks. 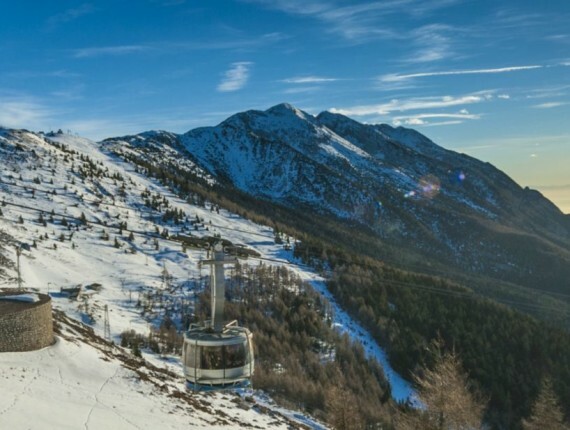 It is thanks to these particular features that Mount Baldo has earned the name of “Garden of Europe;” veritable interconnection between the Alps and the Mediterranean. Mount Baldo is therefore the ideal place to observe or study many different animal and plant species that today are hard to find elsewhere. However it is as much perfect for hikers and enthusiasts who are able to appreciate and respect the enchanting nature of this area. Its particular geographic position makes enjoy extraordinary panoramic views – as if suspended between sky and earth – from a natural terrace, easily to reach by cable car.